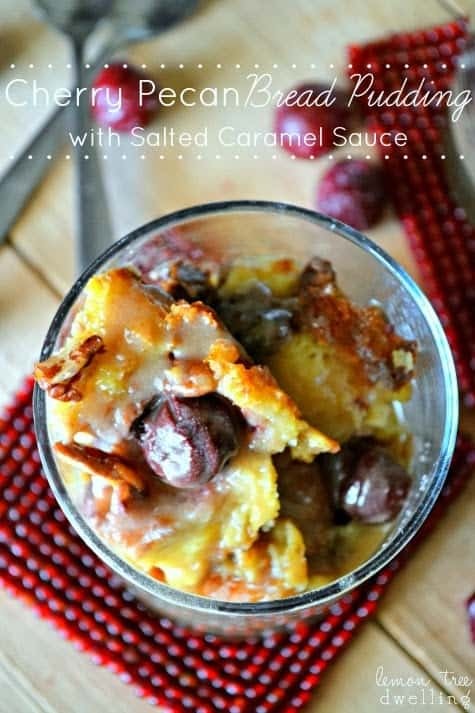 Cherry Pecan Bread Pudding with Salted Caramel Sauce is a delicious comfort food for those cold winter nights. 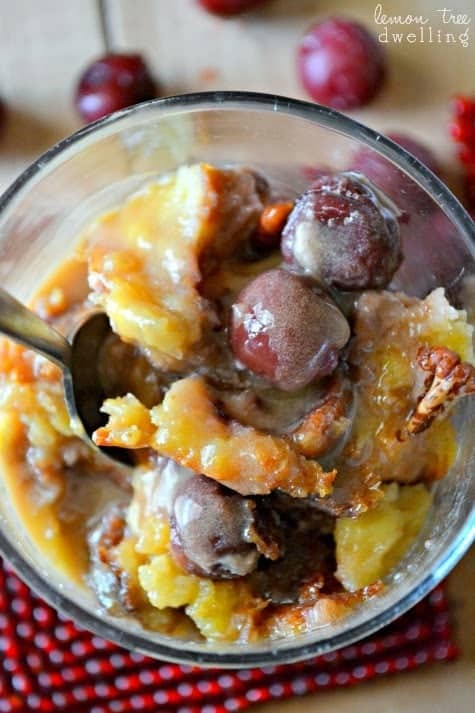 Classic bread pudding made with pecans and cherries and topped with a creamy salted caramel sauce. So tasty! This past weekend was an exciting one around here….because Ellia scored her VERY FIRST goal in soccer! Woo hoo! She’s been playing for a year and a half, and has come close to scoring so many times….but this weekend she finally did it! And she could not have been more EXCITED. The only problem? I completely missed it!! And not because I was talking instead of paying attention to the game (who would do that?!?) but because I wasn’t even at the game! I was at home with Nora, because the game fell right smack dab in the middle of her nap time. The fact that I missed her first goal wasn’t so much a big deal for her…..she was still super excited to tell me about it when she got home and to go pick out her new Rainbow Loom rubber bands as the special “reward” her dad had promised her. No….it was a much bigger deal to me. I’ve been at nearly all her games and watched her come close every time before! And not only that….but I’ve been there for nearly all of her “firsts” in life, and it’s hard to miss one she’s been working toward and wanting for so long! 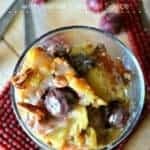 Cherry Pecan Bread Pudding – A delicious dessert! Life is like that, I guess. Sometimes we miss really important things. Which, oddly enough, makes me think of this bread pudding. Right around the time I was taking these photos, and inhaling the delicious aroma of freshly baked cherry pecan bread pudding, I decided I REALLY needed to try a bite. I just couldn’t resist! And….it was delicious!! But it had a crunch to it I wasn’t exactly expecting. At first I thought it was just an extra crunchy pecan, so I took another bite, and….same thing. 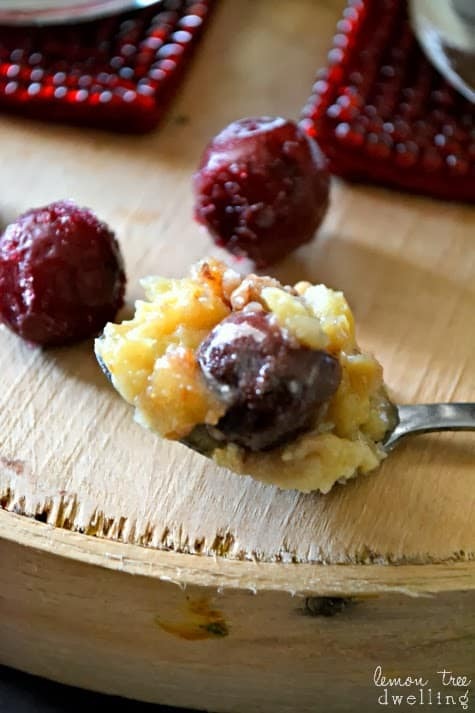 Would you believe – I forgot to take the pits out of the cherries?? Yep, pretty important, I know. Like I said – sometimes we miss really important things! The good news, I guess? There’s always next time. Heat oven to 350 degrees. Butter a 2.5 qt. baking dish. Set aside. In a large bowl, whisk together eggs, milk, cream, vanilla, sugar, and salt. Stir in pecans and cherries. Place bread in buttered dish and pour the egg mixture over it, pressing the bread down to submerge it. Let sit for 30 minutes, pressing down the bread occasionally. Dot with small pieces of butter; place in preheated oven and bake until golden, approximately 1 hour. Serve warm with salted caramel sauce. *Can be made up to 1 day in advance; refrigerate, covered, and warm in 350 degree oven for 40 minutes. In a medium saucepan combine brown sugar and cornstarch. Add water and half and half. Cook and stir until bubbly; cook and stir 2 minutes more. Remove from heat; stir in butter, vanilla and salt. 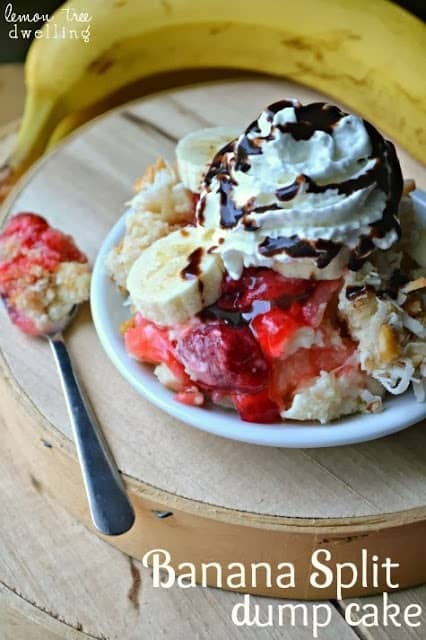 Be sure to check out these other delicious dessert recipes! 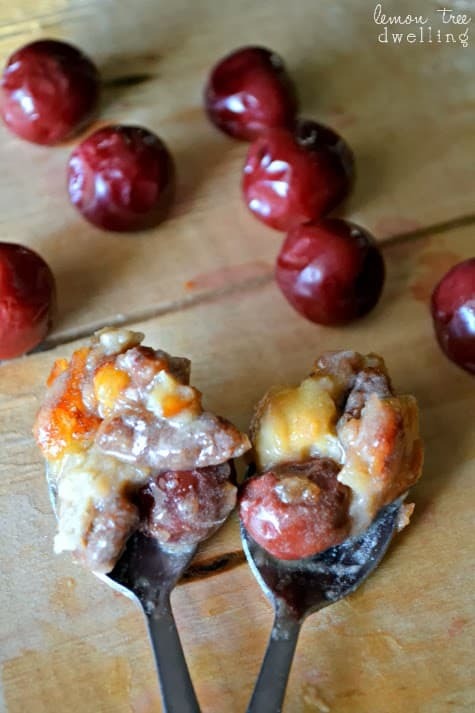 You should check out this Fresh Cherry Crisp recipe from Genius Kitchen! Way to go Ella! Poor Cathy! Yes, there will be other goals and other firsts but I know your Mommy guilt kicked in I’m sure (damn Mommy guilt!) I’m sure she was thrilled to share the excitement with you though and that is QUITE special too! This recipe looks so yummy, I love the combo of flavors! Hope you and your family have a wonderful holiday! Yeah Ella!! That is so exciting! I know what you mean, I seem to always be looking away at the critical moment like baskets and handsprings. Cathy, thank you for sharing you forgot to take out the pits! Yeah you are normal too! This looks fabulous! Good Grief YUM is all I have to say about this! Nice to find you on the linky party today. And thanks for a great recipe. 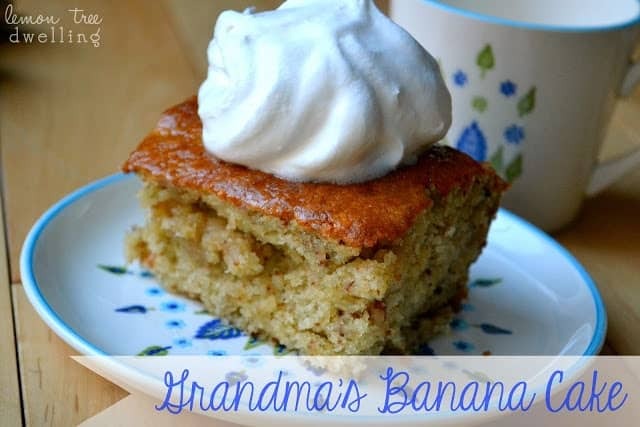 Haven’t made bread pudding in years – this looks fantastic! 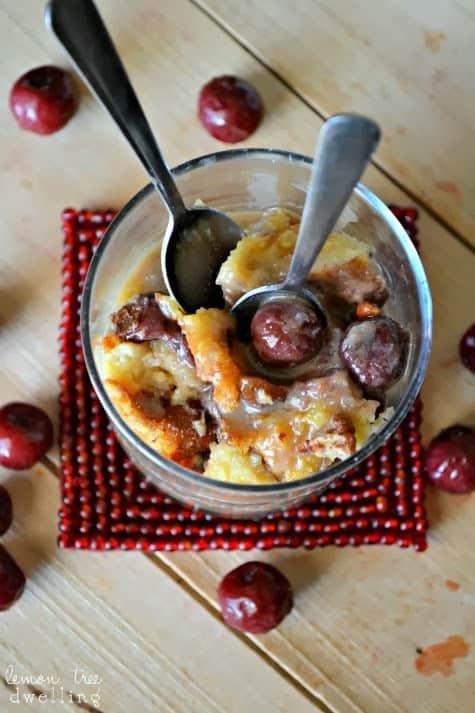 I’ve never made bread pudding, but I know my husband and I would devour this cherry bread pudding! Looks fantastic! Should I make the the bread stale like other bread puddings?